Essex Premier made the finals of the Inter County Rinks competition, after two victories over Wiltshire at Guildford Indoor Bowls Club. Essex were due to play Northampton in their group of three but due to the weather conditions were unable to get to the venue. This left both sides Essex and Wiltshire qualified by default but agreed to play for first and second place in a double header. Essex got off to a flyer as Greg Wade, Alan Kay who stepped in for Jake Atrill with him unable to attend due to the weather, Mark Chittock and Mitchell Young rattled to a 18-5 victory. Derek Coates, John Pye, Chris Coates and Craig Burgess had to stick to the task a take a narrow 12-9 win. In the other fours, Matt Dillon, Paul Bax, Steve Killington and Antony Fautley won handy 17-4 – to give Essex a 29 shot lead. Babs Morokutti, Nigel Reed, Keith Paxman and Dom Reed came through 13-5 winners to win overall by 37 shots. Essex then went up a gear in the second round against Wiltshire as Coates, Pye, Coates and Burgess made light work this time around to win 16-7. Dillon, Bax, Killington and Fautley blew the Wiltshire four away with a 28-5 victory – with Essex already 32 shots to the good. Reeds’ quartet added to the light hearted atmosphere, as Morokutti, Reed and Paxman won 21-9 to extend Essex’s advantage. The final four to finish was Wade, Ian Arthur, Chittock and Young who came home comfortably 17-7 – to take a whopping 53 shot victory and top the group. Credit goes out to the Essex and Wiltshire players that attended in such bad weather conditions. Essex now look to the New Year for the finals of the rinks competition at the end of January. This entry was posted in Short Mat Bowls, Sport and tagged England Short Mat Bowls, Essex short mat bowls, Northampton short mat bowls, short mat bowls, Wiltshire short mat bowls. Leyton Orient grab their first win since the start of September with a 4-1 victory over high-flying Sutton United at The Matchroom Stadium. Orient took an early first half lead from the spot, as Macauley Bonne struck home. The O’s doubled their advantage early in the second half, after a Matt Harrold header. Bonne got his brace later in the half with a fierce strike from close range, Tommy Wright scored Sutton’s consolation as James Dayton restored their advantage with a long range deflected strike. Justin Edinburgh oversaw his first home game for the O’s and made one change to his side that lost 1-0 away at Solihull Moors, as Alex Lawless started ahead of Henry Ochieng. Orient started brightly and four minutes in a corner by Jobi McAnuff came to Dan Happe at the far post but his shot was well-stopped on the line. The O’s were given a gift just five minutes in, as Dayton raced into the box and was brought down by Simon Walton which gave the referee no option but to point to the spot. Bonne stepped up and despite Jamie Butlers attempt to put off Bonne fired the ball into the top corner. Sutton had an opportunity to respond, as Ross Lafayette found room inside the box but his shot was palmed away by Dean Brill. The away side again pressured the Orient defence, as a long ball up field was flicked on for Craig Dundas to guide on goal but Brill stopped the shot. Bonne was given another chance for his second goal, as a high ball was not collected by Butler to spill in front of Bonne who lifted the ball goalwards but was cleared off the line. A great move by the host almost doubled their lead, as Matt Harrold played the ball out to McAnuff who burst into the box clipped the ball across the six-yard box and Bonnes’ header went just wide of the target. In the second half, Sutton pounced on a poor clearance and Craig Eastmond’s shot was held by Brill. 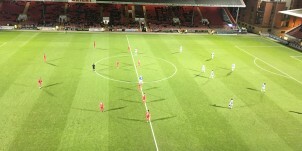 Orient grabbed their second of the afternoon, through McAnuff’s quality set piece delivery Harrold guided in. The hosts grabbed their third with ten minutes remaining, as Dayton slipped in substitute David Mooney whose shot was blocked only for Bonne to fire in the follow-up from close range. 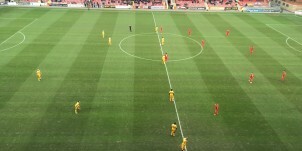 Sutton denied Orient’s clean sheet, as substitute Tommy Wright struck from inside the box for Sutton to beat Brill at his near post. Dayton restored Orient’s three goal cushion shortly after, with a long-range strike which deflected into the far corner to claim all three points for the O’s. This entry was posted in Football, Sport and tagged England, Football, Leyton Orient, National League, Sutton United. 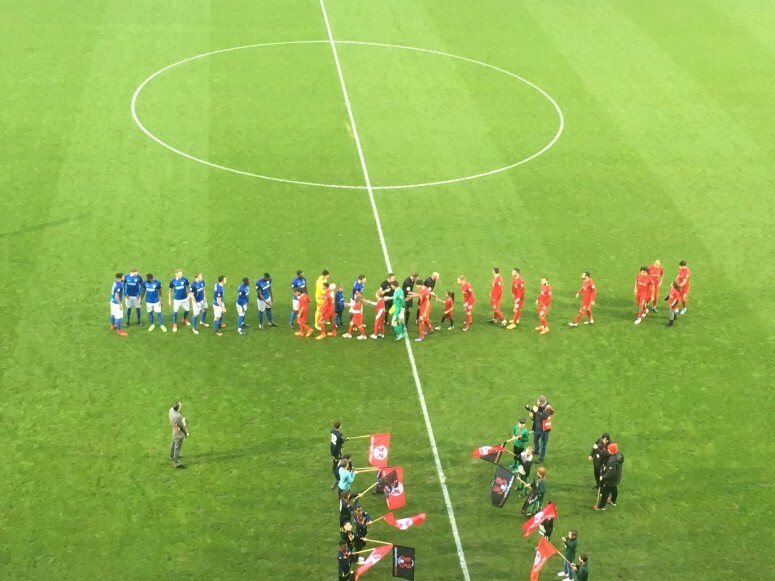 10-man Leyton Orient grabbed a 2-2 draw at home to Chester after an eventful evening at the Matchroom Stadium. The O’s took an early lead just moments into the match, as Macauley Bonne’s flicked on header sent the Orient fans into ecstasy. Chester levelled shortly after, as James Akintunde’s delicate touch was deemed to have crossed the line. The visitors then went on to take the lead with a superb free-kick from Ross Hannah before the break. Orient then found themselves down to 10-men, as Jamie Sendles-White was sent off as he brought down the Chester midfielder inside the box. Sam Sargeant came to the rescue and saved the resulting spot kick to end an eventful first half with Interim boss Ross Embleton also sent to the stands. Jobi McAnuff got the equaliser in the second half with a brilliant strike to share the points, as Orient remain at arm’s length above the relegation zone. Embleton named an unchanged eleven after Orient’s 1-1 home draw against top of the league Dover Athletic at the weekend, as Sargeant kept his place in goal with Charlie Grainger out injured after the warm-up on Saturday. The O’s asserted the early pressure with a succession of corners and almost grabbed the opener, as James Daytons’ corner was met by Joe Widdowson but headed just over the bar. 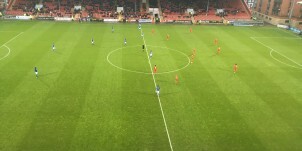 Orient grabbed a deserved lead six minutes in, after a McAnuff cross was delicately guided into the far post by Bonne to get the Brisbane Road rocking. Chester got a bizarre equaliser nine minutes later, as a deflected shot bounced goalwards and Akintunde guided the ball on target for Sargeant to palm onto the post and away but the linesman deemed the ball to have crossed the line. Orient went in search of their advantage again as the ball was slotted into Bonne, he teed up Dayton to strike a fierce shot on target but was well stopped by Alex Lynch. The visitors went in front five minutes from the break, after Hannah’s free-kick was bent around the wall and beat Sargeant down low to his right. Just on the stroke of half-time, there was a few minutes of madness as Sargeant flew out his box miss timed his headed clearance which let Nyal Bell in on goal he was then brought down by Sendles-White inside the box and the referee pointed to the spot. He then sent off Sendles-White with the O’s down to 10-men. Hannah then stepped up and his shot was superbly stopped by Sargeant to deny the away sides two goal cushion. The evening got worse for the O’s as Embleton was sent to the stands in added time of the half with the Orient fans venting their frustration at the break. 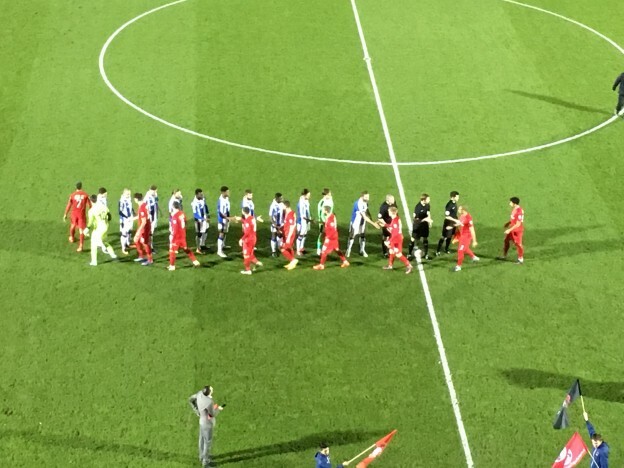 In the second half, Orient looked comfortable down to 10-men and got their reward with an equaliser on the hour mark as McAnuff continued to surge forward and hit a shot from 25-yards into the bottom corner with Lynch rooted to the spot. The hosts thought they had won it at the death, as Jake Caprices’ high cross into the box was challenged by substitutes Matt Harrold and then fell to David Mooney on the volley which he fired narrowly wide of the target as Orient settled for the point. This entry was posted in Football, Sport and tagged Chester, Football, Leyton Orient, National League, Non-League. 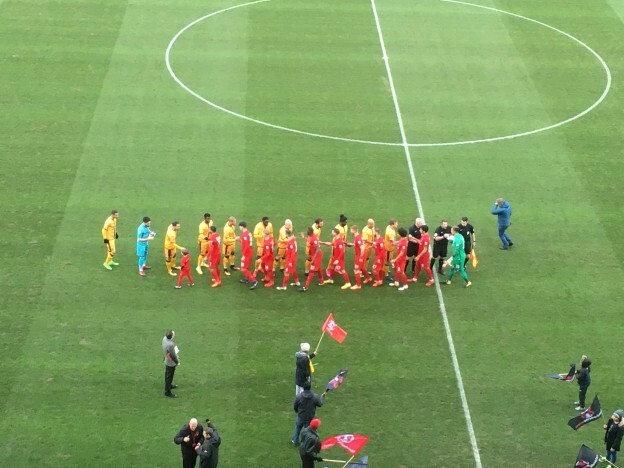 Leyton Orient grabbed a 1-1 draw in Ross Embleton first interim game in charge against the league leaders Dover Athletic at The Matchroom Stadium. Dover took a first half lead through Nortei Nortey’s strike from close range to maintain their momentum at the top of the National League. Orient got their deserved equaliser in the second half, as Craig Clays’ curling effort found the back of the net with Orient still three points off the relegation zone. Ross Embleton took temporary charge of Orient after the departure of Steve Davis and made five changes to the side that lost 2-1 away to Ebbsfleet United. Macauley Bonne returned for the O’s from International duty with Zimbabwe, as Jobi McAnuff captained the side after a return from a toe injury. Joe Widdowson reclaimed his place after he served his suspension and Craig Clay returned to the lineup. With David Mooney, Matt Harrold, Mark Ellis and Zain Westbrooke were all side-lined. Charlie Grainger was injured in the warm up, which left Sam Sargeant to step up to the mark for his first game of the season. Within the opening minute, James Alabi was slipped through one-on-one with just Sargeant to beat, after a mistake from Joe Widdowson but he superbly denied the visitors the lead. Orient then surged straight up the other end on the counter attack and from the resulting corner Dayton’s whipped in ball was just headed over by Bonne. The hosts had their first real opportunity, as Dan Happe surged forward played a lovely ball to Bonne who laid the ball to Clay to slide in James Brophy who cut it back for Clay but could not guide the ball on target. Alabi again the threat for Dover, as the ball was lifted over the defence and he was in a footrace with Widdowson but blazed his shot over from inside the box. Dover then broke the deadlock 23 minutes in, as the ball was cut back to Nortey who fired first time into the far corner to take an early advantage. A long stoppage halted the match, as Dover’s Josh Passley crashed into the advertising hoardings, recovered but then went down in the next phase of play and had to be substituted for Lou Fazakerley. In the second half, Dover had the first opportunity of the half as Connor Essam rose for the cross but miss-timed his header. Orient somehow could not get the ball over the line, as Bonne with the first header was palmed away by Mitch Walker and then Happe’s header was cleared off the line as Dover scrambled the ball clear eventually. The hosts then grabbed that elusive equaliser 13 minutes from time, after great work from Clay to create the chance laid it to Dayton who returned the pass cut back inside and curled his shot into the far corner. Orient thought they had won it with five minutes to go, as Dayton’s ball to the far post was met by Bonne who thought the ball had crossed the line but was clawed away by Walker, as Orient settled for a point. This entry was posted in Football, Sport and tagged Dover Athletic, Football, Leyton Orient, National League.